There may come a time during your retirement when you can no longer fend for yourself and continuing to live in your own home is too difficult or even impossible. A nursing home may be the only option if you have mobility problems or significant health issues that require regular care or supervision. Once you make the decision to move into a nursing home, it's time to find one that you will feel comfortable in and can envisage yourself living in for the rest of your life. Here are a few of the things that you need to think about when choosing a nursing home. The costs are going to be a key factor in which nursing home you ultimately choose. Look into how easy it'll be to make payments in the long-term and what will happen if you can no longer pay the fees. Will it be easy for family to get to the nursing home? If not, you may want to cross a particular nursing home off your list as you may not be able to fall back on a good support network to help you make the adjustment to moving from your own home to a nursing home. Is there adequate car parking for relatives to visit? Has the nursing home got the facilities that you'll require? For example, is there wheelchair access if you'll need a wheelchair to get around? If you struggle to get in and out of the bath, will the design and set-up of the bathroom facilities help with this or will assisted baths be offered? Are residents given their own room or will you have to share with others? After a tour of the nursing home, you should feel that the facilities adequately meet your needs and if this is not the case, it probably isn't the right nursing home for you. Make sure that your chosen nursing home has passed the necessary inspection tests and are considered to offer good care for residents. If you're at all sceptical about this, ask to see inspection records. Do the staff come across as being experienced, friendly and caring? It's important that you feel comfortable around them as they will be responsible for looking after you in the nursing home. 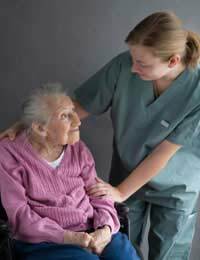 When you visit the nursing home(s), find out as much as you can about the training that the staff have been received and the amount of experience that they have amassed. Take a look at the residents when you visit. Does the atmosphere seem happy and content? If you sense a negative vibe, it should ring a few alarm bells in your mind as to whether you'll be happy either. It's vital that you feel comfortable and secure in the nursing home that you choose as this will be your new home. There are various factors that you should think about when making your decision and wherever possible, it's a good idea to make more than one visit to each of the nursing homes on your list so that you can make an informed assessment of each of these factors.